Refer to chemical chart for resistance of Polyester and Vinyl ester polymer concrete. Standard products are manufactured using polyester resin. When greater chemical resistance is required, Vinyl ester channels are available to special order, contact ACO for details. 1. Type(s) of chemical(s), including mixture composition %. 3. Contact time with trench system. 4. Temperatures of chemicals flowing into the trench drain. (82°C max). 5. Flushing system employed to clear chemicals from the system. 6. Cleaning agents should be checked for compatibility with trench materials. 7. 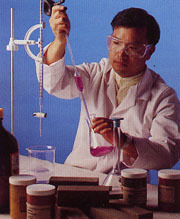 Test samples can be used for final determination of chemical resistance. 8. Grate, locking mechanism, edge rail, outlet and rubbish basket materials should be checked for chemical resistance. 9. Check sealant for compatibility, if applicable.